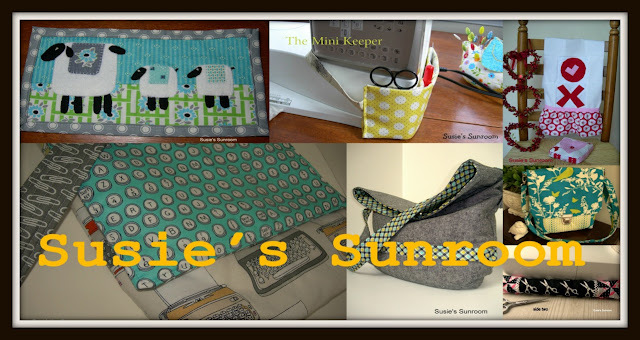 I love to visit Susie of Susie's Sunroom and see the many useful and attractive projects she sews. Lately I've noticed she has changed the pictures in her blog header a few times and I was curious how she does it. Luckily she gave me some tips. I love the way everything is color coordinated in spring colors! So my blog has a new look! I look forward to more sewing, improving my skills at photography, editing, and making picture collages so I can update my blog's appearance for seasons and holidays! I love your new header!! Your photos and colors are gorgeous for spring! Did I miss a blog post for your adorable sheep quilt?? Adore it!! And did you take the sheep in the meadow picture? This is a fresh breath of spring!